Edinburgh scrum-half Sean Kennedy has signed a new two-year contract, committing him to the Pro12 side until May 2019. Kennedy, 26, has been with the club since 2011 and has had loan spells at Glasgow Warriors and London Irish. He has represented Scotland at under-20 level and played for the country's sevens team. "Staying at the club was an easy choice for me and I'm excited to be involved for another two years," Kennedy said. "I genuinely believe we have a really good squad and a huge amount of potential. We've shown we can beat any team on our day, but it's about finding the ability to do that consistently." 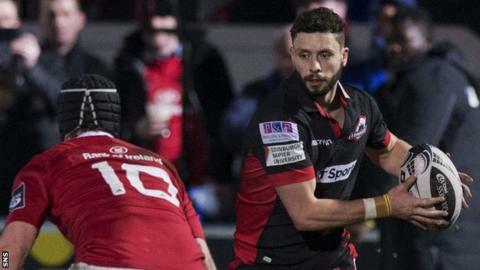 Edinburgh, who will have Richard Cockerill as their head coach next season, finished 2016-17 with victory at Glasgow Warriors on Saturday. Acting head coach Duncan Hodge led them to a ninth-placed finish and he will revert to his former role as attack coach. And Hodge said of the club's scrum-halves: "Sean, Nathan [Fowles] and Sam [Hidalgo-Clyne] thrive on the competition for a spot in the side, and that will continue to drive their standards as individuals and as a group."